Shoulder sitting is a no-no for agressive male umbrella cockatoos. Living with an umbrella cockatoo is easier if you get to understand his moods. Males, for example, are known for being aggressive. When yours is feeling antagonistic, you'll save yourself some aggravation and maybe even bodily harm if you recognize the warning signs and know how to handle the situation. Aggression in male cockatoos can be displayed in a number of ways. One of the first cues that Paco is feeling aggressive is that his crest goes up. He might screech and scream. He could yell angry or demanding words like "Let me out!" "Come here now!" or any other phrases in his repertoire while he rattles the bars of his cage. Aggressive cockatoos are territorial, so when you approach his cage or perch he may lunge at you or even bite you. Don't be surprised if Paco goes out of his way to show you hostility by flying over to nip you even when you're nowhere near him. Male cockatoos often become aggressive in breeding circumstances, but that isn't the only reason for the behavior. Cockatoos are high-maintenance birds who demand attention. If they don't get it—and haven't been trained properly—they will become aggressive in an attempt to bully you into spending time with them. Sometimes your reactions to Paco's behavior can compound the situation. For instance, if you respond to his screaming by yelling back at him, he may take it as a challenge to see who can be louder, and it could end up in blood being drawn, yours to be specific. At other times jealousy could be the cause of aggression. Cockatoos, like most hookbills, tend to be one-person birds. If Paco perceives that another pet or human is competition for your affection, he could become aggressive in his "rival's" presence. Early training of your umbrella cockatoo will show him what acceptable behavior is, and will limit aggression. Consistently expecting him to respond to your commands will reinforce the acceptable way you want him to act. 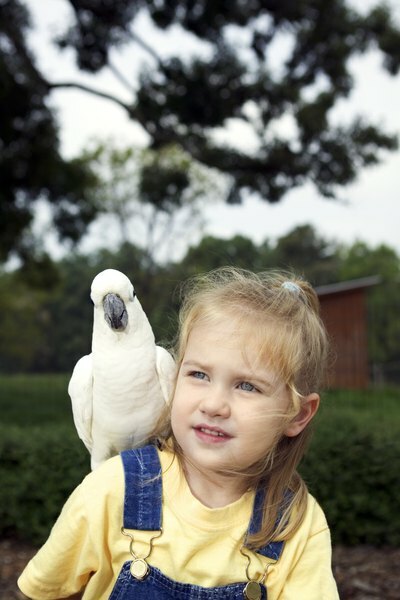 Parrot expert Mattie Sue Athan recommends placing your cockatoo's cage below eye level and not allowing him to sit on your shoulder so that he isn't physically located above you. Give your umbrella cockatoo consistent attention, too. Determine how much daily quality time you can spend with him at the start and then don't short-change him. Try to give him his one-on-one time at about the same time each day, if possible, to give him something he can count on to look forward to. On the occasions when Paco does act up, give him a "time out" in his cage, covering it up if he becomes too loud. If your umbrella cockatoo has an enemy to attack, he can take his aggression out on it instead of you or the rest of the household. Ideally this would be an inanimate object like one of his toys. If it doesn't happen to be a toy but is an object that you don't mind if he destroys, then it can be used to divert his attention. Whatever your cockatoo has chosen to focus his hostility on, distract him with it when he begins showing aggressive behavior and allow him to fight it out with the substitute adversary. What Causes a Cockatoo to Pluck?